Many nurseries grow trees from seed, and most home gardeners can grow a tree or two from seed with a little time and effort. The process provides an interesting learning project for gardeners and science students alike. Tree seeds generally must undergo maturation, dormancy, stratification and germination before a new seedling emerges from the ground in the spring. The prospective tree-grower must collect and process seeds, provide the proper processing and duplicate the stratification and, in some cases, scarification that nature would provide. Harvest seeds when they mature. Maturation happens when the fruit or flower the seeds grow in matures or when the seeds themselves drop from the tree, often at the end of the growing season in the fall. Be quick about harvesting seeds—you’ll be competing with birds, squirrels, rabbits and other animals. Process your seeds. Remove “wings” and husks or other coverings. Pick seeds out of fruit and cut the flesh of the fruit away, then pick or wash seeds out of smashed soft fruits. Clean seeds completely and pat dry except for plants like holly, dogwood and plum, which should be kept moist throughout extraction. Flesh left on seeds can begin to ferment, damaging the seeds. Clean and dry the seeds to prepare them for storage in a moist, cool place like the vegetable crisper of a refrigerator. Store seeds in freezer bags in a part of the refrigerator that is kept just about freezing and check seeds periodically to make sure they stay moist. These conditions mimic the conditions of seeds that have lodged in the ground over the winter. Some seeds, like oak and buckeye, must be kept moist throughout winter storage and some, such as holly and dogwood, must be kept dry in storage. Others, like hickory and walnut, do not need to be stored but can be direct-seeded in the fall. Duplicate the conditions of dormancy. All seeds need a rest during which natural processes prepare them for germination. Keep seeds in a cool, moist environment to stimulate the production of enzymes that energize the embryonic plant within the seed in a process called “stratification.” Some seed coverings are very hard and require “scarification." You can scarify seeds by scratching their surfaces with a knife—it duplicates the abrasive processes in animal digestive systems. Some seeds need both processes for dormancy to end. Sow tree seeds in the spring when the ground warms and let them soak up the spring rains. Alternatively, try planting seeds in a pot in a south window. Keep the soil moist—tree seeds need constant moisture to germinate; however, avoid overwatering seeds. Plant seeds in well-drained soil amended with manure, compost or peat moss and use light potting soil for pot-grown seeds. Once temperatures warm in late spring, seeds will begin germinating. Protect seedlings with mulch and fences made of chicken wire. The same birds and animals that competed for seeds in the fall are ready for some “greens” now that spring is here. Cover fall-sown seeds with chicken wire to discourage rodents looking for winter food. Find specific dormancy requirements for the type of tree you are planting to increase your odds of success. 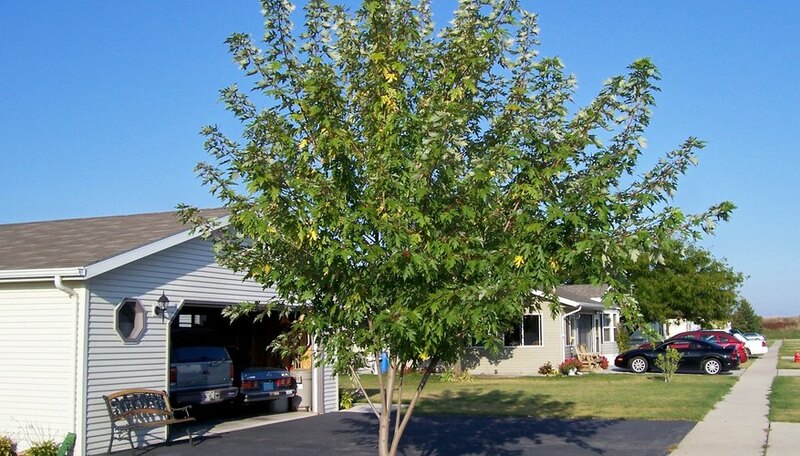 Allow your tree to grow for several years before attempting to shape it. Once it's a sapling, it is healthy enough to withstand pruning and you can follow its natural shape. Many fruit trees do not grow "true" to type without specific grafted root stock. Trees grown without the right grafts may be weaker or bear different fruit than the parent. When Does a Birch Tree Shed Its Seeds? What Seeds Need Cold Treatment?